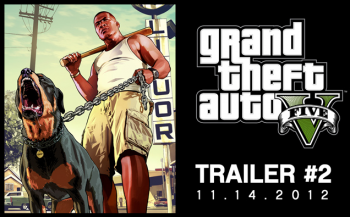 You'll have to wait till November 14th for your next GTA V teaser. Grand Theft Auto V has been a long time coming, and in a world without hurricanes we'd have had the next trailer by now. Rockstar has been kind enough to confirm that, now it's had a chance to take stock post-Sandy, the trailer's due November 14th. You may remember the last trailer, which started internet tongues a-wagging. We still don't know who the protagonist is, or what he does for a living, or even what gang-related gun-fun will occupy his time in the sun-soaked pseudo-Californian pesthole he moved to. Nor do we have a confirmed release date, beyond Spring 2013. However that is a nice looking dog this fella has there. Cheerful, even; no doubt it's good with kids. A dog like that you could imagine chasing Frisbees in the park, or bringing down a fleeing hobo. Just the sort of animal you could imagine fitting right into the GTA V universe.